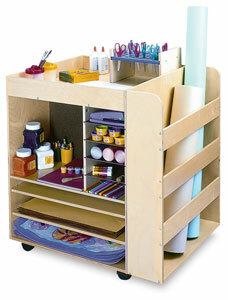 The Whitney Brothers Rolling Art Cart is a great solution for classroom clutter — just roll it over to the next project! Featuring birch plywood construction, it has sectioned shelves on two sides for storing paper and supplies. A third side contains a deep bay for storing larger supplies and paper rolls. Special care is given to ensure all edges and parts are smooth, rounded, and firmly attached to keep them from breaking free or cracking from rigorous use. The top of the cart has a raised lip to keep supplies in place while the cart is moving. The Rolling Art Cart has four heavy-duty casters. It measures 33"H × 30"W × 24" (84 cm × 76 cm × 61 cm) and weighs 73 lb (33 kg). The Whitney Brothers Rolling Art Cart is Greenguard Indoor Air Quality Certified and Greenguard Children & Schools Certified. Made in the USA. The Whitney Brothers Rolling Art Cart includes a lifetime warranty.